American ingenuity is responsible for the creation of Falcon tobacco pipes. Read on to learn a bit about Falcon history. American engineer, Kenley Bugg, designed the Falcon tobacco pipe in 1936. His aim was to create a dry and cool smoking pipe. This led to a unique design which features an aluminum stem system shaped like a corkscrew with a small sink-like dish at the base to trap moisture. The unique metal design of the stem, allows the bowls to be interchangeable briar pieces. The patented design took off after World War II, selling over six million units between 1954 and 1963 in the United States. In 1963 the production of Falcon parts moved to a plant in Great Britain, where it remains today. The British influence benefited the American company. Falcon added “Dry Rings” to the sink, which fit snugly and absorb fluids. 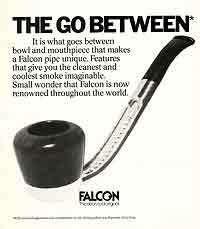 Nearly 50 million pipe smokers, the world over, smoke a Falcon pipe. Falcons are prized for their unique art-deco-like design and ability to be unique statements about the smoker. Falcon pipes can be combined in over a thousand different ways. The look of Falcon pipes is often referred to with nostalgia for the chrome and tail fins of old Fords. These pipes, despite now being produced overseas, are a piece of 1950s and 1960s era Americana that are treasured by millions. By purchasing a smoking pipe in pieces, the creation of the standard “Seven Day Set” is much more economical. Stems can be interchanged with different bowls, which are significantly less expensive than purchasing a whole other pipe.